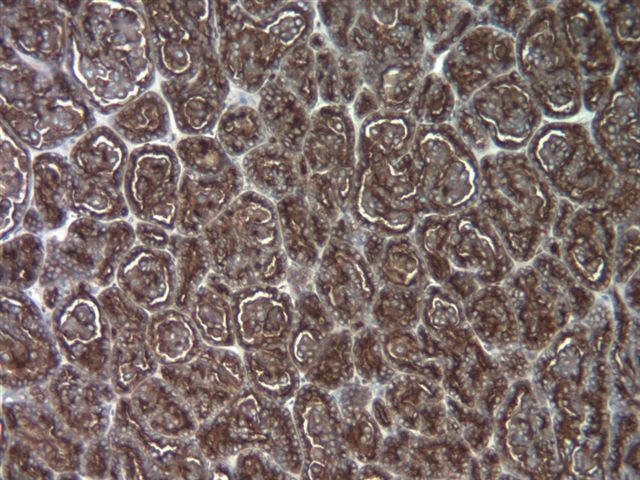 Papillary carcinoma is a common subtype of renal cell carcinoma, representing 10-20% of adult tumors.� It is also called chromophil carcinoma, and some cases were previously called granular type.� Accurate classification is important because these tumors tend to present at an early stage and to have a better prognosis than other types.� These tumors are often multifocal, are immunoreactive for CK7, and usually have trisomy 7 or 17.� Classically, they are defined as having at least 50% true papillae. 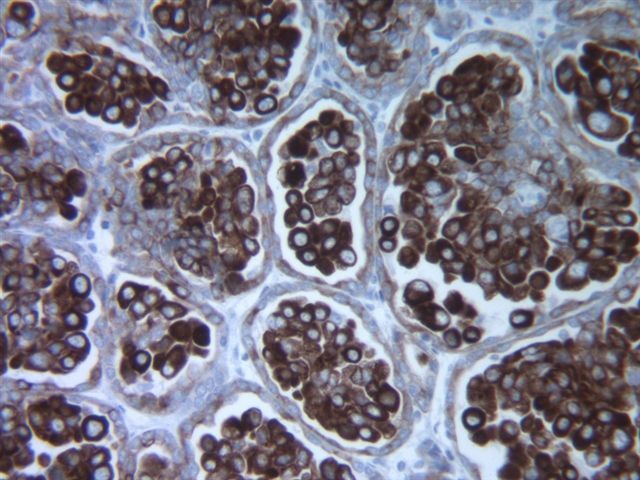 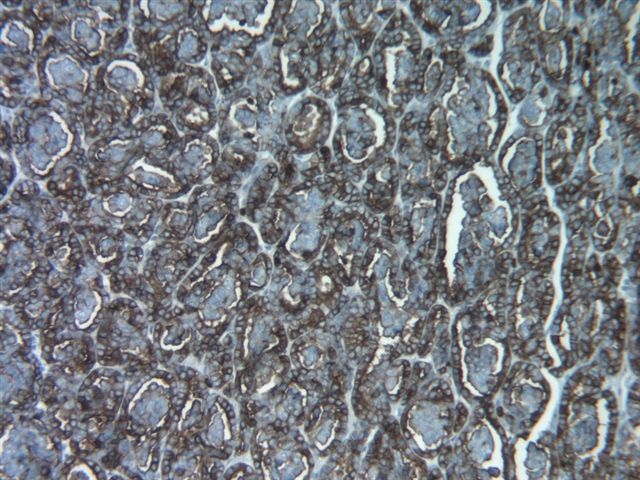 The solid variant was first described in detail in 1997 (AJSP 1997;21:1203).� It contains sheets of cells, often with distinct micronodules resembling abortive papillae, but with no true papillae.� Cells have abundant eosinophilic or clear cytoplasm with vesicular nuclei and often prominent nucleoli.� Tumor cells are immunoreactive for CK7 and EMA, and negative for 34betaE12 (high molecular weight keratin) and vimentin.� As with classic papillary carcinoma, there is often trisomy 7 or 17. 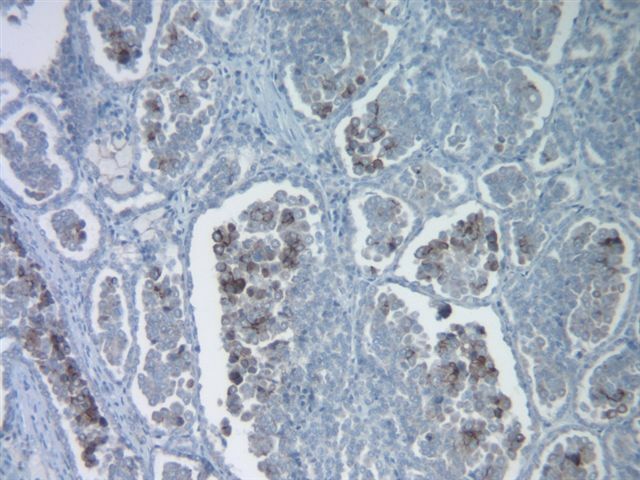 The differential diagnosis includes mucinous tubular and spindle cell carcinoma, a recently described subtype of renal cell carcinoma which also has a compact tubular architecture with focal papillary features and a similar immunohistochemistry profile as the solid variant of papillary carcinoma.� However, it has a low grade spindle cell population not found in papillary carcinoma (AJSP 2006;30:13). 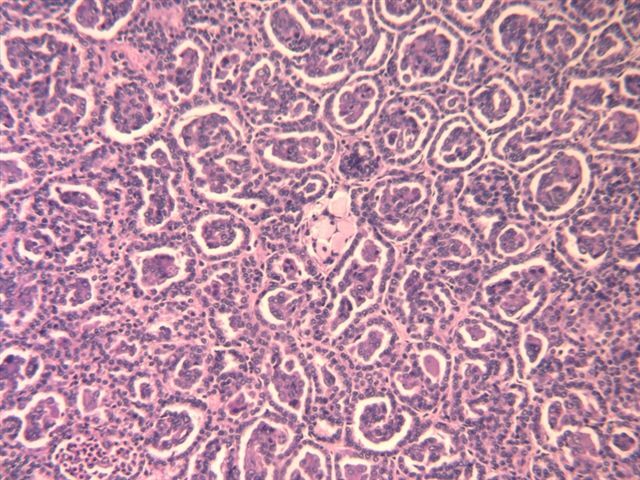 The differential diagnosis also includes metanephric adenoma (Chang Gung Med J 2001;24:582), which may also exhibit trisomy 7 and 17 (J Urol 1997;158:370, but see Mod Path 2003;16:1060).� However, the cells in metanephric adenoma are more primitive with scant cytoplasm, instead of abundant eosinophilic cytoplasm, and the chromatin is hyperchromatic and grainy with instinct nucleoli.� In addition, metanephric adenoma typically is vimentin positive with only focal CK7 immunoreactivity, and is EMA negative.